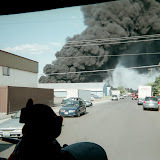 NARRATIVE: On Wednesday July 8, 2009 at 08:30 AM, 7 Companies of Spokane Firefighters, 3 Engines, 2 Senior Ladders, 1 Pumper-Ladder and 1 Heavy Rescue under the direction of Battalion Chiefs Green and Hanna responded to a reported residence fire at 614 West Montgomery. A resident in the two-story single family residence converted to an apartment contacted Fire dispatchers via 911 at and reported that the residence was filling with smoke and there was a fire. The neighborhood fire company arrived within four-minutes and reported smoke showing from all sides of the two-story apartment house. They followed up with additional information that a significant amount of fire was spreading in the rear of the home from the first floor to the second floor. It was unknown at the time of the alarm whether all occupants were able to evacuate from the home during the fire. The first engine stretched pre-connected hose lines to the first floor with four firefighters to attack the fire and confine it in order to allow for a safer atmosphere for other companies as they searched for possible victims. Nearly simultaneously, a Ladder Company arrived and immediately entered and began to search both floors of the home to locate potential victims. Additional companies placed ground ladders to the exterior, ventilated the roof and backed up the initial attack crews and extinguished the fire in the adjoining areas while continuing to search victims. The fire was controlled in just twenty minutes. They were successful in confining the fire to the rear of the home and attic and limited spread into the address side (front) of the structure. PROBABLE CAUSE: The official cause is under investigation currently by the SFD's Special Investigation Unit. Preliminary information given from residents at the scene to the media suggested that the cause was electrical; however the cause has not been determined at the time of this release. DAMAGE EXTENT: Significant structural damage on all floors and attic in the rear of the converted structure. Spokane Firefighters IAFF LOCAL 29 and the Washington State Council of Fire Fighters (WSCFF) Burn Foundation team up to provide citizens of Spokane free smoke detectors. The WSCFF has matched a $500 donation made by the Spokane Firefighters Union to buy $1000 worth of smoke detectors for Spokane families. 55 smoke detectors have already been purchased. They will be presented to Jan Doherty, the Spokane Fire Department’s education officer by Greg Borg, President of Local 29. There will be more smoke detectors to follow. When the fire department responds to a call in a residential home, if there is no detector, one - if available, can be installed by Local 29 members - City of Spokane firefighters. This service, as well as the detector, is free to homeowners and renters. However, landlords are required by law to provide detectors for their renters, and may be charged for the cost of the detector. City of Spokane residents can also stop by a fire station to obtain a detector. Detectors will be provided on a first-come-first-served basis until all are distributed. The smoke detectors will soon be available. For more information, please contact Local 29 President Greg Borg at 998-3617, Vice-President Mark Vietzke at 710-2045, or the Local 29 office at 484-5598.